One of the guys that runs Utilitycycling.org, Josh Lipton, has been tapped by BikeCommuters.com to provide us a few guest articles that our bike commuting readership would benefit from. Josh is also employed (he’s the President) by a few bike related online retailers: www.BikeTrailerShop.com, www.BikeBagShop.com & www.BikeKidShop.com. If you’re not too familiar with their sites, I’ll give you a simple breakdown of each. 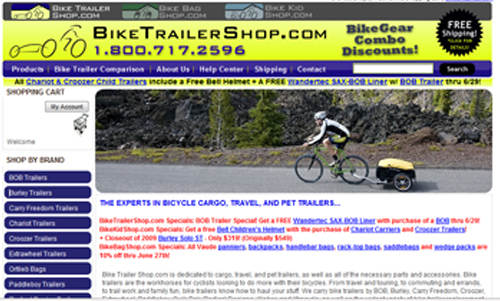 BikeTrailerShop.com-They have a huge selection of bike trailers like the BOB, Burley, Extrawheel as well as the world famous Xtracycle. BikeTrailerShop.com can pretty much equip your bike so you can use it more of a utility vehicle to carry large loads or if you simply want to get away to do a bit of S24O (pronounced “Es-Two-Four-Oh�?). www.BikeBagShop.com-This is a great resource for bike commuters in general because we all have to carry our stuff. You can pick up racks, panniers, messenger bags, handle bar bags, frame bags,backpacks and so much more! www.BikeBagShop.com & www.BikeKidShop.com. -Personally I love this site. They have all sorts of accessories for your child to make their bike riding experience a great one. 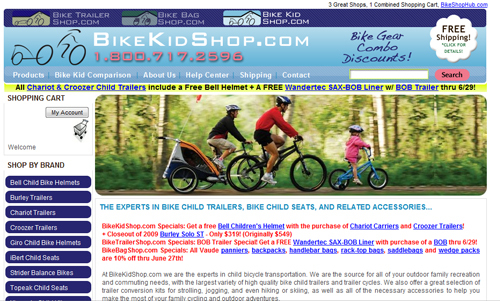 The site offers, bells, training wheels, Xtracycle child accessories, child bike trailers, iBert child seat as well as helmets. Each site is pretty user friendly and have pretty much the same feel and look. The product categories on the left hand site of the pages allows the user to find what their looking for quicker. Have a look at our variety of bike child trailers in BikeKidShop.com and you’ll see the depth that we intend to cover in the other categories that you mentioned. 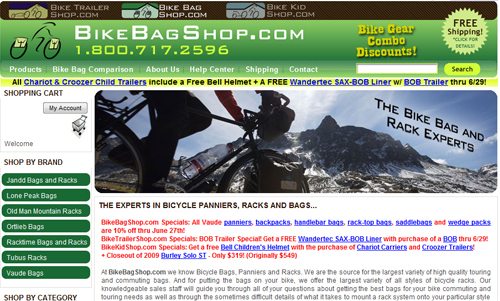 I would also encourage you to take a look at the depth of expertise with which we’ve covered bicycling bags and racks at http://www.BikeBagShop.com as well as bike cargo trailers at http://www.BikeTrailerShop.com. Again, I appreciate we’re you are coming from in critiquing BikeKidShop.com. We’ve got our work cut out for us and we’d definitely like to hear suggestions from readers as to what directions we should consider in adding in new children’s specific cycling products.